All kids are fascinated with shooting some kind of projectile into the air…am I wrong? I happen to be one of the parents who is constantly fighting (and losing) the ‘no toy guns’ battle. We have a few basic rules, like no shooting at people, but aside from that, I try to just help them understand how to play with these toys responsibly. Then came the Unicorn Popper by HOGWILD Toys! This is the perfect mix between something very cutesy and soft, combined with the flying projectiles that kids love. If you’ve read any of my blog before, I try to make learning fun. 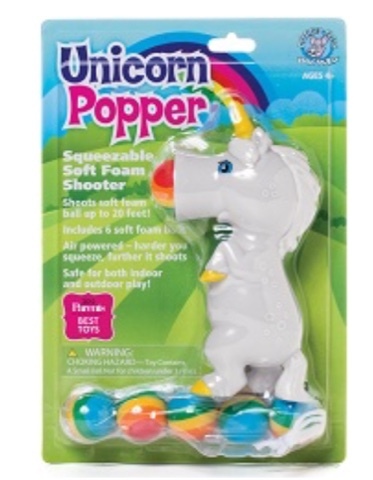 This usually requires either some out of the box thinking or for a ‘toy’ like the unicorn popper to fall in your lap. 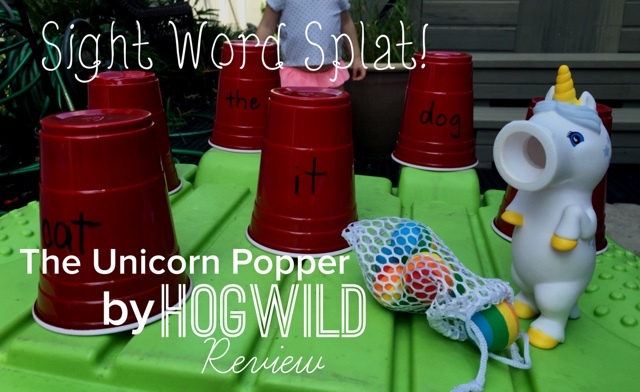 As soon as I saw this, I thought it would be the perfect toy to use for our sight word splat game, great for 4 and 5 year olds! 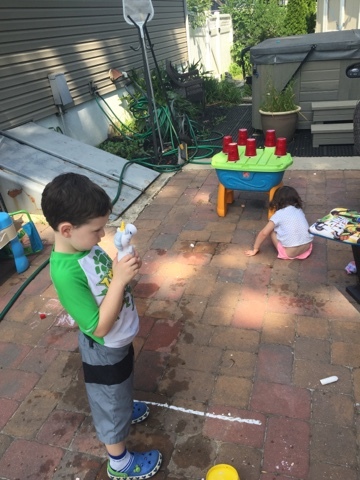 This is a game we play in multiple variations, usually with water balloons, squirt guns and chalk. 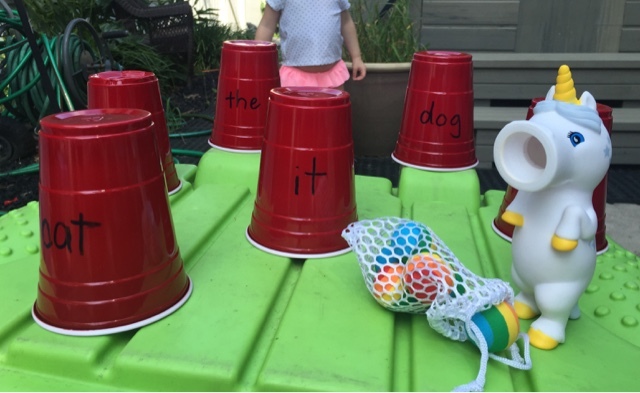 It’s essentially taking any object or toy, and using it to help my little ones identify different sight words. The unicorn popper is great because it can be used indoors or outdoors, and the foam balls are very soft so if it ‘accidentally’ hits a sibling another person it won’t hurt. This product is designed for ages 4 and up, which I found to be pretty appropriate. My 2 year old loved the toy but had a bit of a hard time using it and squeezing the belly independently. My 4 year old had absolutely no problems using this toy on his own, and on top of that had a blast with it! 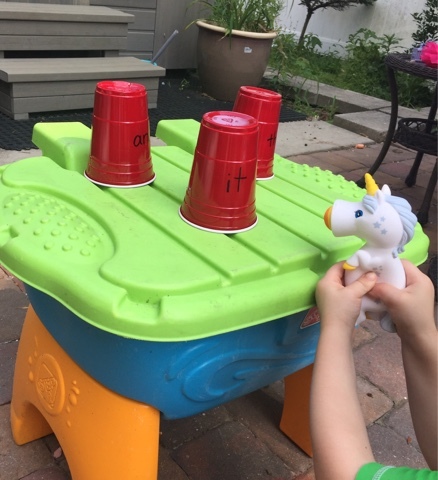 While this post highlights the use of it with our sight word game, Mack (4) has been shooting it around the house non-stop. He is a pretty active kid that is always fidgeting with something, the popper is almost like a really fun stress ball for him to squeeze. And as for the ‘and up’ age recommendation…lets just say it’s accurate…I can’t say I haven’t enjoyed playing with it! 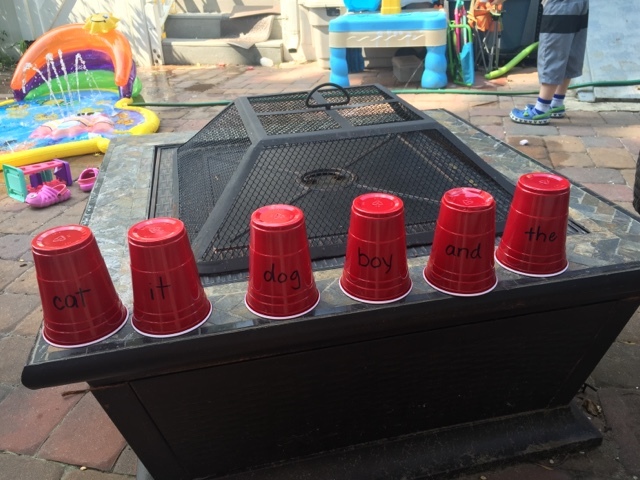 For our game, I wrote six basic sight words on some red solo cups with permanent marker. We set them up on a closed water table so that they were at a good height to be hit with the popper. 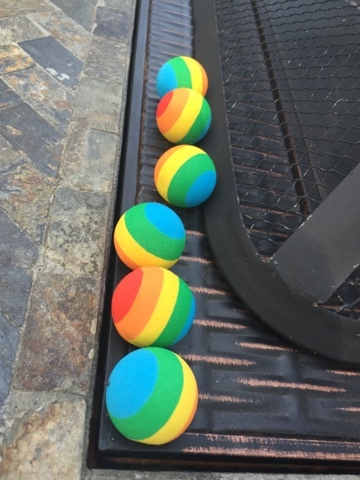 The popper comes with 6 soft foam balls in a super cute rainbow pattern. I love this attention to detail- HogWild makes a variety of animal poppers- one of my favorite things to look at is how the pattern on the ball corresponds with the animal. Mack lined up his balls and got ready to blast some sight words! We drew a line in chalk pretty far back from the table because these bad boys can shoot up to 20 feet! 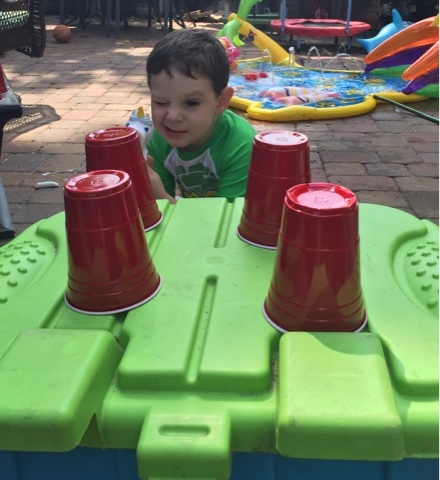 Although they can shoot that far (if you squeeze the belly hard) it is difficult to aim or make them go in a straight line…so Mack continued to inch closer until he could knock over the cups. The repetition of shooting multiple times really reinforced the reading of the words on the cups! We continued calling out words, taking aim, and shooting the cups until we had successfully gotten all of the sight words. 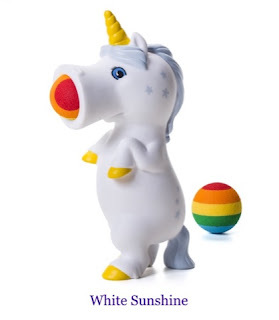 I love the incredibly gratifying POP sound that the unicorn makes when you shoot a ball! We had a blast playing this game and with the popper. I would definitely recommend this toy for children (and adults) of all ages! Disclaimer: I received the products or services mentioned above for free in the hope that I would mention it on my blog. Regardless, I only recommend products or services I use personally and believe will be good for my readers.